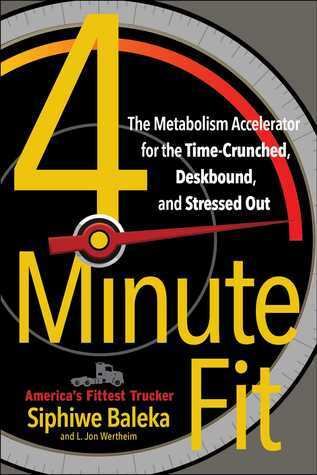 From Yale-educated truck driver and fitness guru Siphiwe Baleka, a revolutionary metabolism-spiking program for anyone who feels they don’t have enough time, equipment, or money to get in shape and lose those extra pounds. When Siphiwe Baleka, who had once been a NCAA Division I athlete, began truck driving in 2008, his whole lifestyle changed. Within weeks his metabolism slowed drastically and he gained ten percent of his body weight. He knew he needed to take back control of his health and wellbeing and change the sedentary lifestyle of truck driving—one of the country’s least healthy industries. Now, Baleka, founder of Fitness Trucking and full-time fitness coach for Prime Inc., one of the nation’s largest trucking companies—and now one of the healthiest—helps thousands of Prime’s long-haul truck drivers, who have also struggled with weight and health problems, with his 13-week nutrition and exercise plan. Combining step-by-step workouts and advice on healthy eating (even on the go), 4-Minute Fit is a flexible, yet powerful plan that is proven to boost your metabolism, provide results, and help you get rid of those extra pounds and reach your weight loss goals. Baleka’s program is geared not only for those who drive eighteen-wheelers, but also for anyone who travels for work, has a job that involves a lot of sitting, or doesn’t think they have enough time to exercise and eat better. If you’re frustrated by the weight gain that comes from not being active enough due to your job or lifestyle, 4-Minute Fit is the simple new guide that can radically change your life. Siphiwe Baleka is the founder of Fitness Trucking, LLC and serves as the Driver Health and Fitness Coach at Prime Inc., a commercial trucking company based in Springfield, MO. His innovative, on-the-go wellness program has helped thousands of truck drivers lose weight and reclaim their health. Formerly, Baleka has served as the Driver Health Editor for both Road King magazine and The Trucking Network magazine, and failed to qualify for the 1992 US Olympic Swimming Trials in the 100 freestyle by just 0.8 seconds. He graduated from Yale University and is the first African American ever named to the First Team All-Ivy League Swim Team. He is the author of 4-Minute Fit. L. Jon Wertheim is the executive editor of Sports Illustrated, a sports television commentator for various networks, and author of nine previous books including New York Times bestsellers Scorecasting and You Can’t Make This Up. He lives in New York City. This is a great flexible step by step guide on how to loose weight, keep it off, and work out all in one. Just one week after using the steps in this book I feel more energized than I have in some time. If you are on the road a lot and think you don't have time to eat well think again! This book gives you the tools to do so.